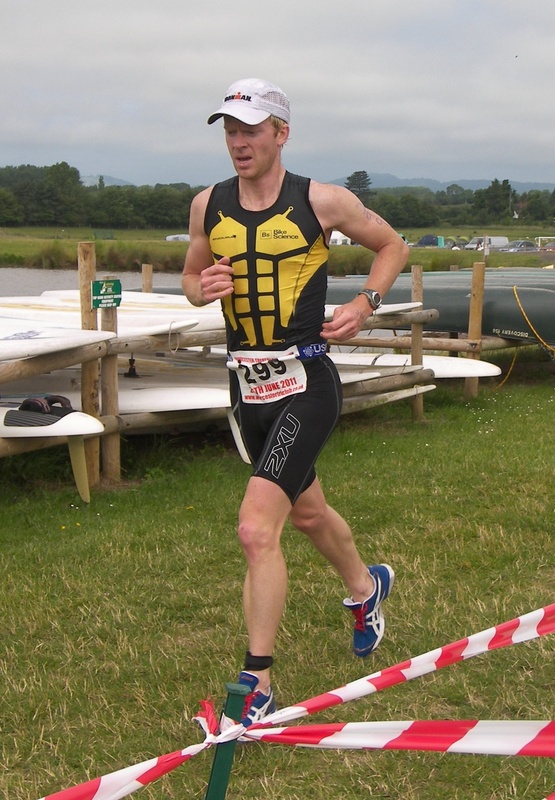 Returned to the Top Barn venue near Worcester last weekend to take part in the Worcester Sprint Triathlon. I competed previously in 2008 and 2009, coming 2nd both times. The Malvern Hills Ultra (55M) race that I won back in May starts about 800m away, from Holt Castle. So I’ve had some good times there! The main aim for me was to try and beat my 2009 splits, as that race was also two weeks before Roth. 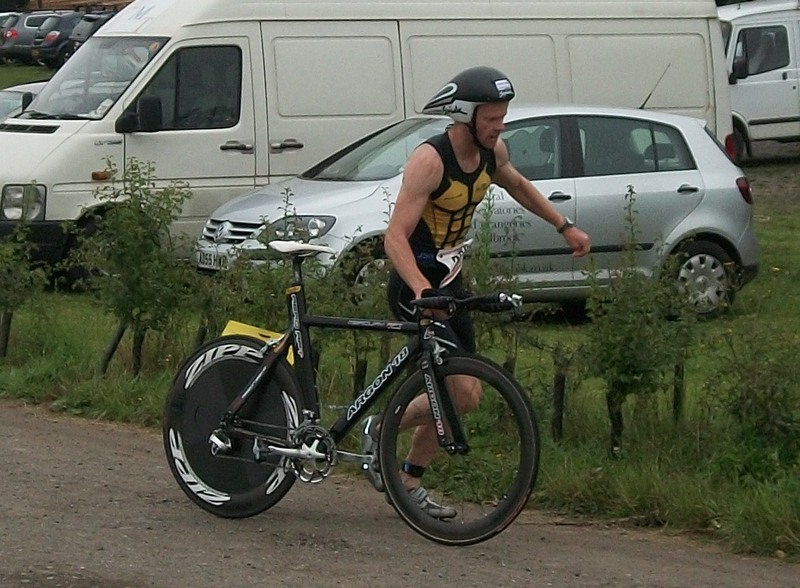 The only name I noted from the line-up was Andrew Shipton who I knew had a good swim and bike. Unfortunately there were three wave starts and I was placed in a different wave(1). I had my parents and girlfriend down, sat with the other spectators overlooking the lake from Top Barn. It’s certainly a very spectator friendly race and we had very hot conditions. 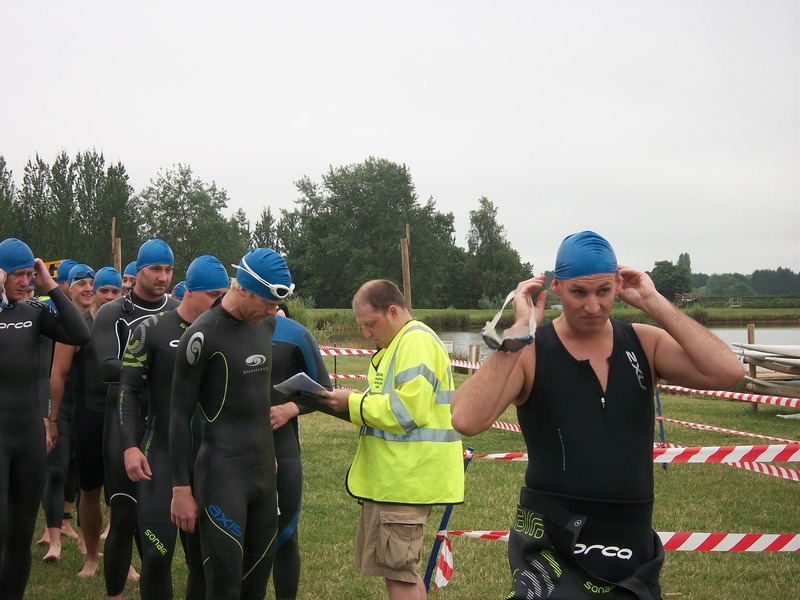 As you can see from the pic I didn’t hang around in the swim. I lined up dead in the middle and went hard from the gun. I had a look around and spotted a decent swimmer to my right so I latched on to him. After about 200m I saw a swimmer come over the left side, so I moved over to him instead. From that point on we gradually pulled away from the rest of the field. I was very comfortable drafting behind the leader (Neill Crump) and wondered whether to try and overtake and get up to optimal effort, or hang back and save my energy for the bike. I tried to overtake a couple of times and thought better of it. He may have speeded up a little to show me who’s boss anyway. On the (sludgy) exit from the lake I sprinted into T1 and over the first timing mat. I’d done 11:51, which was 47secs slower than last year. 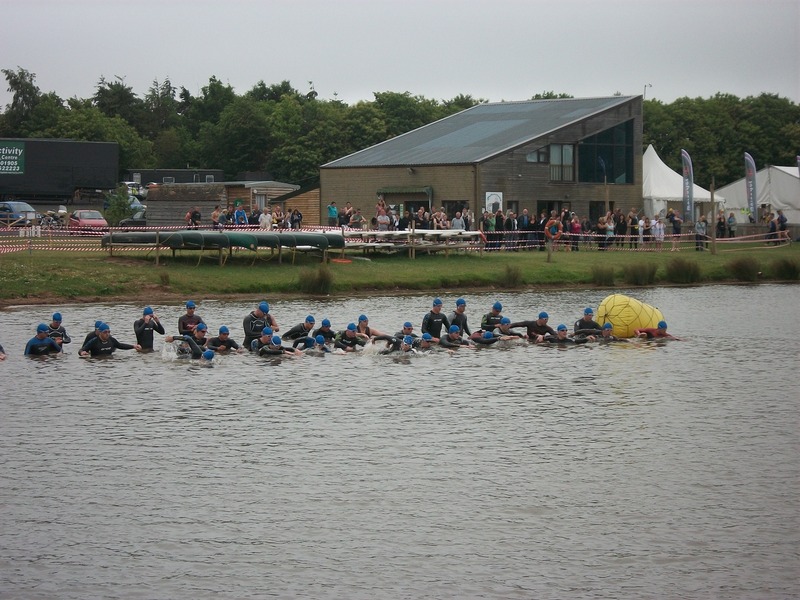 T1 was 37secs which included taking off the wetsuit. Once on the bike I got my head down and worked really hard. I was waiting to hear someone come by, possibly the leader of the swim and told myself that as long as I got through Martley (halfway) then I could try to stay with them and push it on the run, my strongest discipline. I passed plenty from the double-distance race (on their second bike lap) but no-one came past me. My split time was 47:01, 56secs slower than last year. This was disappointing because it felt like I had optimised the bike and almost time-trialled it. I couldn’t have gone quicker. They had introduced a couple of foot-down stops at the main Worcester road but this wouldn’t have made a huge difference as you have to slow down on approach anyway. The disc wheel slightly rubbed on a couple of sharp uphills but I soon fixed that by loosening the brakes. T2 was 25secs, 4 secs slower. I started the run very quickly; at least it felt like it. In 2009 I battled it out with Tom Watts (2010 winner) for most of the course before I pulled away on the steep hill at halfway. This year I had about 3mins lead starting the run so I didn’t have anything/anyone to pace to. I dropped my coke flask 400m in, and then developed a stitch after 1mile. This was just before the steep hill so I didn’t go too hard, and after around 800m of light running I started to test the water again and build the pace up. I never completely lost the stitch and it certainly held me back in the race. The run split was 19:40, and 31secs slower than 2009. But with a slightly longer hill route and the stitch I’m not too fussed about that. Overall time was 1:19:36, and 2:24 slower than 2009. Although I’d come 2nd overall it was probably a little strange for my parents and girlfriend to see me a little disappointed. But there you go, positions don’t tell the whole story. I wondered what might have happened if I’d been in the same wave as Shipton. I may have been able to get out of the swim at the same time (11mins) but he had a strong bike so I may not have caught him on the run. I picked up some cash, bottle of wine and a voucher so not all bad! In terms of the impending Ironmans – well, I’ve obviously lost speed. I feel my strength and stamina are suitable enough but who knows what I’m going to get from power, which is correlated to speed. You need a decent amount of power alongside muscular endurance in an Ironman if you want to get a decent time. One other big factor has been my recovery from the virus and cold in the last 8 weeks. My resting heart rate still fluctuates from 46-51bpm even after rest days, when it should normally fall within the 42-44bpm range, suggesting something still isn’t quite right. On the bike segment of the triathlon I felt my heart stress a couple of times and had to just back off a little. That’s not normal either and perhaps there’s an element of post-viral fatigue. The run has suffered the most in the last two weeks – heavy legged and a more pronounced fallen arch at the base of the left foot that explains a (very) slight compensation/limp in my running this year. Lots of rehab work and drills lined up once I get the summer out of the way. I’m driving (2-day trip) to Nuremberg with Yve from Wed 6 Jul. Challenge Roth is on 10 Jul. We’re then staying in Suhl (north of Nuremberg) for a few days before driving home. I’ll post about Roth before we leave.